Want to get a sense of our community? Get involved by joining one of our community events! Here are a few that we recommend for the month ahead. We're Celebrating 10 Years in beta! We might be getting older, but we still know how to party. Come celebrate with us our 10th year in beta! OH: Get your story right! E-waste: can your blender save the planet? OH: Is your startup ready for journalists? OH: Taking Care of Your Mood Swings! OH: Building a startup without a CTO!? OH: Communications - Where to start? 10 years in beta - Come celebrate with us! Looing for a venue for your next event? Make your next event awesome by booking one of our spaces. 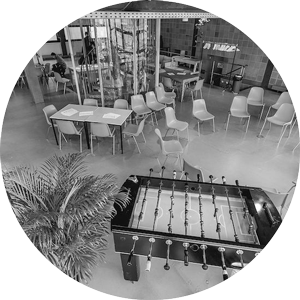 Did you know that a coworking membership at betahaus | Berlin includes free access to all of our community & startup events, including betabreakfast, betabeer, and office hours? Our membership options start at 99,- per month. We host 1,000+ startup events per year in our four inspired event spaces. 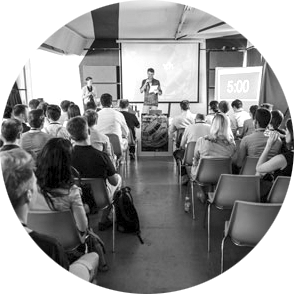 Find out how betahaus can help with your next event. Creative ventures require creative space. Inspire your guests in our space with a private balcony and floor-to-ceiling windows on two sides overlooking Berlin! And perhaps the best part? The space can easily be combined with our panoramic Bungalow and rooftop terrace. The Innospace was love at first sight for us. With high ceilings, huge windows on two sides, and an interior glass wall, the room is super bright and offers a glimpse of everything going on inside the coworking space and on the street below.